This is part of Aya One, the first chapter of Hotsuma Tsutae. It starts with the childhood of the talented woman known as Wakahime. It’s packed full of anecdotes about festivals and customs. 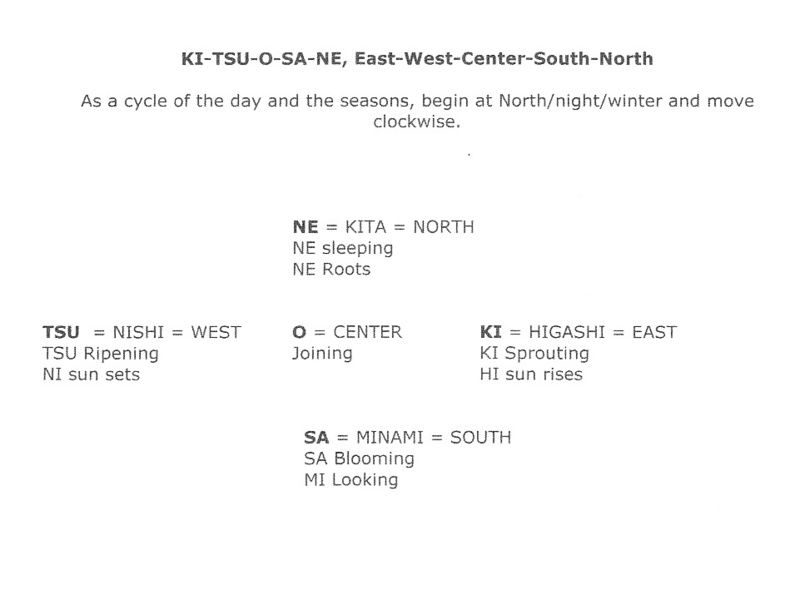 Then, Wakahime’s foster father Kanasaki, now known in shrines as Sumiyoshi Kami, explains the meaning of the five direction system, ki-tsu-o-sa-ne (E-W-Center-S-N). He connects it with diurnal and seasonal processes and implies a philosophical framework for society with a cyclical orientation. Ki-tsu-o-sa-ne in a profound way relates space and time. This is our interpretation starting with the transliteration of http://www.k3.dion.ne.jp/~yamas/kodaiy2k/hotumika/hotu01.htm. We first prepared this in 2013, long before we started the WoshiteWorld blogsite https://woshiteworld.wordpress.com/ . We revised in light of those teachings. We are posting this here because the source is the third party listed above. We recommend that students of Wosite study the blogs of WoshiteWorld. There are many other wonderful stories from actual Wosite verses of Hotsuma Tsutae presented there. One such is the story of the Peach Festival. Another is the origin of sake-making. Aya One is important for imparting important information from Wosite times. It may be startling to see that the Tanahata festival was being celebrated three thousand years ago. Some may have assumed that it came from China in the fifth century. However, note that even the name Tanahata is an ancient Wosite word for a type of loom for weaving. And weaving was done by the ladies in the miya of Wosite. As for mention of having mochi on New Year’s Day, it was not the rice mochi we have today. Instead of rice, different grains were raised, including Japanese millet. ume-re-hi wa kashimi-ke sonae On her birthday, minister made an offering of cooked food. Hi no wotsuru Nishi ha nishi tsumu sun sets, sinks in nishi. Ki no mi yuru. Kimi wa ome kami fruits of tree. Lord is male-female kami. This entry was posted in Hotsuma and tagged aya, Space-Time on 2017/01/16 by Okunomichi.